While other once robust housing markets like China and Australia begin to show signs of weakness and the U.S. continues to struggle, Canada continues to enjoy spectacular growth. Tim Iacono points out that prices and sales volume are up across the country, with the north’s largest cities competing for the biggest numbers. 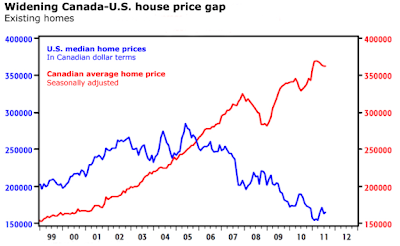 Iacono wonders, though, when the bubble will burst and whether the Canadian housing market will experience the fall from grace seen in so many other countries, including the U.S. For more on this continue reading the following article from Tim Iacono. 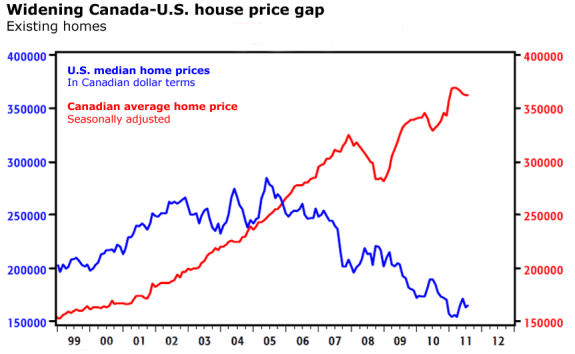 It looks like China’s housing bubble is teetering, sales this fall down by half from the level of a year ago, and the Australian housing market has looked shaky all year, but that Canadian housing bubble seems nearly indestructible, charts like the one below from this Globe & Mail report now a real head scratcher for those of us south of the border. Having just visited Calgary two months ago, I can attest to the residential areas looking a lot like Southern California in about 2005, but Toronto and Vancouver are apparently experiencing even bigger booms, as noted in the Globe & Mail report above, about the only question for residents being which big city will beat the other in price gains this year. Last month, Toronto home prices rose 6.5 percent from a year ago, down from a 9.3 percent pace the month before, and with annual price gains in Vancouver recently falling from 20+ percent to 10.6 percent, a real battle is brewing. They note that “overall the market continues to appear healthy” and an economist offers only a mild cautionary note, words that sound eerily familiar to us in the U.S. This blog post was republished with permission from Tim Iacono.